European Film Star Postcards: Shorts by Pathé Frères. Two years ago, we did this post on postcards for short silent films made before World War I by the French studio Pathé Frères. We loved these very old French cards and recently we found some new ones. They were distributed by Pathé theatres in France, and the films were produced by the studio between 1905 and 1908. French postcard by F. Testard, Paris, no. 4078. 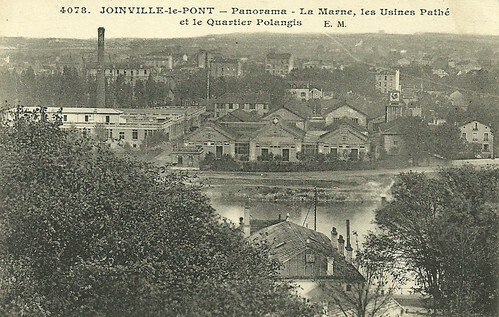 Photo: E.M.
Panorama of the Marne river with the Pathé film factories and the Polangis quarter, at Joinville-le-Pont near Paris. 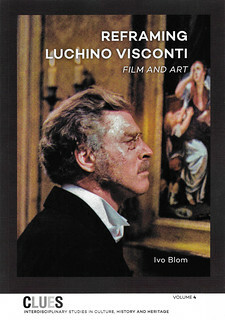 It is here that Pathé produced and developed its celluloid. In contrast to other film companies, Pathé produced its own raw film stock. In its early decades the film studios of Pathé were in Vincennes and Montreuil, but in the early 1920s it would open a studio in Joinville too. French postcard by Eden Cinema Pathé, Nice. Photo: publicity still for Les petits vagabonds/Young Tramps (Pathé Frères, Lucien Nonguet, 1905). 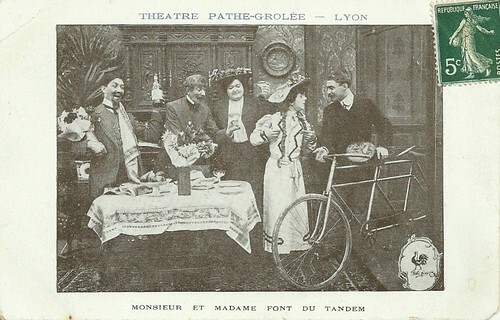 French postcard by Théâtre Pathé Grolée, Lyon. 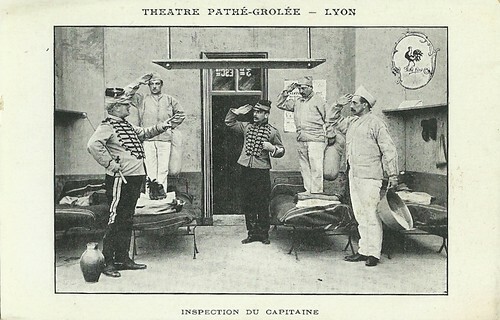 Photo: publicity still for L'inspection du capitaine/Captain's Inspection (Pathé Frères, 1905). After inspection, the soldiers lie down for a well-earned nap. A drunkard enters the room and disturbs the soldiers who throw him out. He keeps coming back and they finally decide to throw water on him, but the captain gets the shower. French postcard by Théâtre Pathé Grolée, Lyon. Photo: publicity still for Le fils du diable/The Devil's Son (Pathé Frères, Charles Lucien Lépine, 1906), with André Deed, and cinematography by Segundo De Chomón. The Devil's son is down in the dumps, so Sganarelle suggests that a trip to Paris would be just the thing to perk him up. Mom and Dad wave bye-bye as he toddles off in his touring car with his native guide. 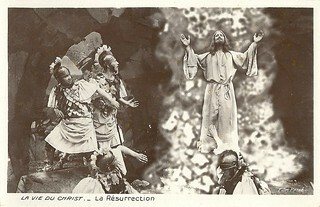 French postcard by Théâtre Pathé Grolée, Lyon. 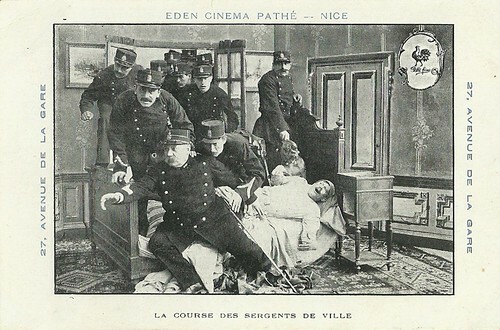 Photo: publicity still for La course des sergents de ville/The Policemen's Race (Pathé Frères, Ferdinand Zecca, 1907), scripted by André Heuzé. A policeman spots a dog stealing a piece of meat from a butcher's shop, and gives chase. Soon several more policemen have joined the pursuit. But the chase does not turn out as the policemen expect. French postcard by Eden Cinema Pathé, Nice. 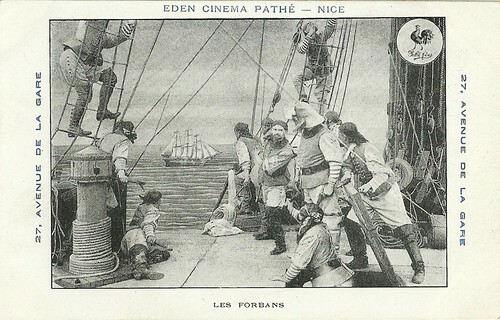 Photo: publicity still for Les Forbans/The Pirates (Pathé Frères, 1907). 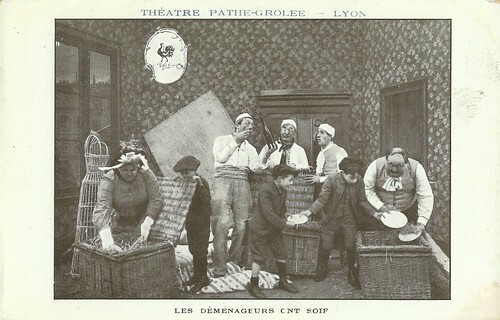 French postcard by Théâtre Pathé Grolée, Lyon. 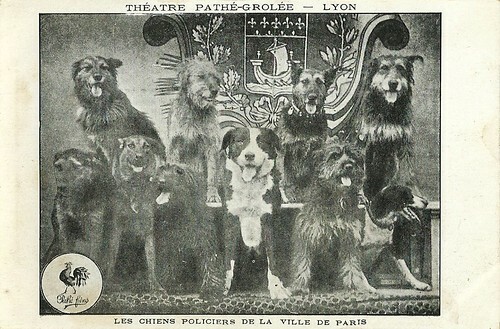 Photo: publicity still for Les chiens policiers de la ville de Paris/The Police Dogs of Paris (Pathé Frères, 1907). 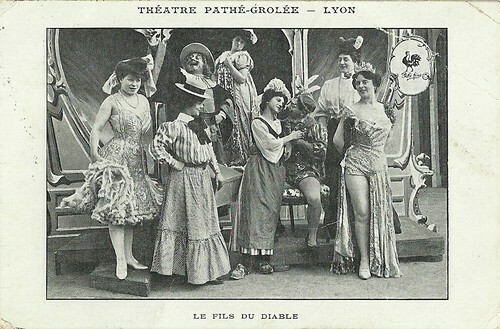 French postcard by Théâtre Pathé Grolée, Lyon. Photo: publicity still for Monsieur et Madame font du tandem/Jollygoods Go Tandeming (Pathé Frères, 1908). A couple decides, after having dined, to go out on their tandem bicycle. They start well, but in speeding over a bridge they upset two pedestrians, who make a high dive into the water. From this point they enter into a ride of destruction and catastrophe. French postcard by Théâtre Pathé Grolée, Lyon. Photo: publicity still for Madame l'avocate/Lady Barrister (Pathé Frères, 1908). A woman attorney is so taken up with her studies in law that she finds no time to bother with household duties. Her henpecked husband has to take care of the baby, clean the house, do the cooking. When things do not run very smoothly, she decides to take a hand in the domestic affairs herself. It all ends in chaos. 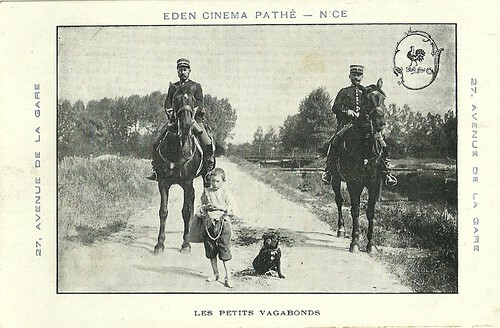 French postcard by Eden Cinema Pathé, Nice. Photo: publicity still for Excursion dans la lune/An Excursion to the Moon (Pathé Frères, Segundo de Chomón, 1908), sets by Vincent Lorant-Heilbronn. Georges Méliès' best-known film, Le voyage dans la lune/A Trip to the Moon (1902), is inspired by Jules Verne's De la terre à la lune/From the Earth to the Moon and H.G. Wells' First Men on the Moon. 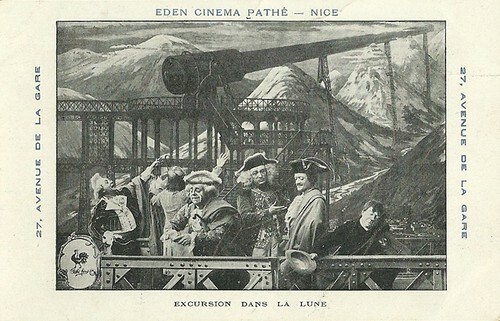 In 1908, Segundo de Chomón made Excursion dans la lune/An Excursion to the Moon, an imitation of Méliès' work, which is preserved with the original Pathé Frères stencil color. 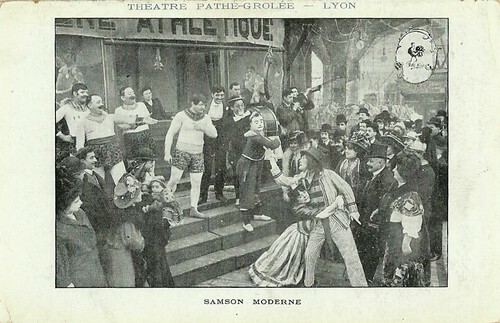 French postcard by Théâtre Pathé Grolée, Lyon. Photo: publicity still for Samson moderne/A Modern Samson (Pathé Frères, 1908). On the fairground an unknown young man manages to conquer the wrestling champion. When after a series of adventures he is imprisoned he breaks down the walls like a modern Samson. Returned home his wife celebrates him with wine but is jealous of his force, so like a modern Delila she cuts his hair off in his sleep. Awakened, the man has lost his hair and his strength. French postcard by Cinema Pathé Frères. 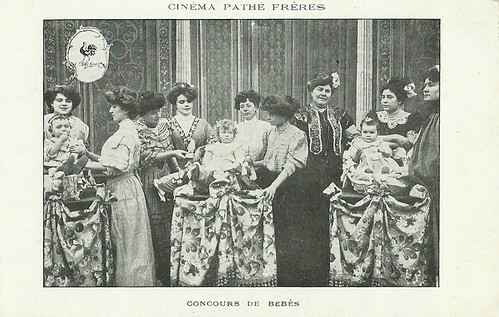 Photo: publicity still for Concours de bébés/The Baby Show (Pathé Frères, 1908). Having much pride in the beauty of her little charge, a fussy governess enters her mistress baby to compete in a baby show. But the baby's elder sister, being whipped by the governess, resolves to even matters, and when the fond nurse-girl lays the infant in the basket and leaves the scene for a moment the little girl takes the baby out and puts a dog in instead. 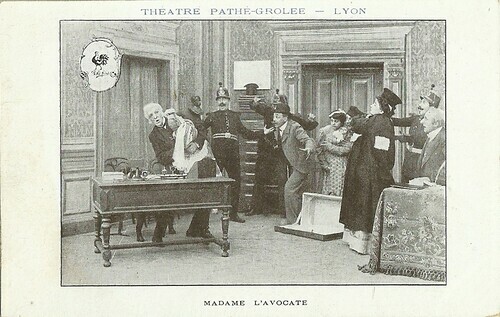 French postcard by Théâtre Pathé Grolée, Lyon. Photo: publicity still for Les démenageurs ont soif/Thirsty Moving Men (Pathé Frères, 1908). Four thirsty movers empty the wine bottles they discover in a basket, after which chaos and destruction starts. The movers destroy and lose most luggage underway, so the owners can only give the drunken movers a good spanking and go and get new furniture. 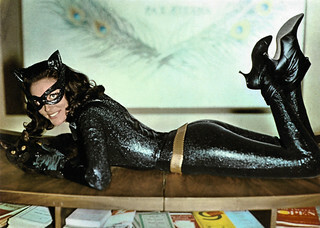 Sources: Fondation Jerome Seydoux Pathé (French) and IMDb.